How’d that asterisk get in there? 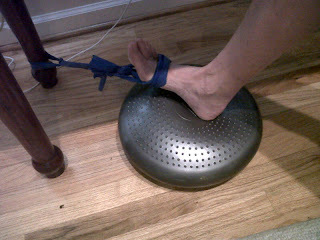 No, really, I truly meant how, as a mother, I am finding time to rehab my legs, that’s all! If you are wondering why the blog-a-thon (blogorrhea maybe) over the last few days, there is a perfectly reasonable explanation. I’m taking a few days OFF from all structured exercise. Need I say more. 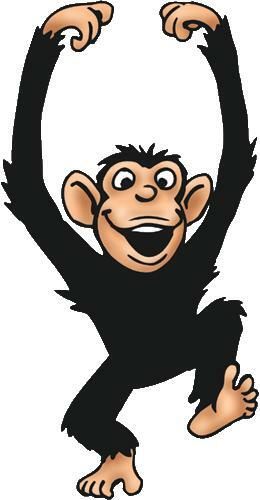 The unspent energy gets redirected to the areas of my brain responsible for writing….and sarcasm. For that I apologize. The time off was strongly suggested by (threatened by?) all those who know and love me and admit I needed it. I’ve been pushing through, digging deep, exercising and working out in every way possible for the last few months and I hit a physical and emotional wall and was starting to come unglued. Anyway, I recently admitted that I have not taken the time to do PT/rehab at home for my lower legs – balance exercises, theraband, calf raises, that sort of thing – or do my part to work out the kinks in the rest of my battered parts either. So I had a brainstorm! I will cleverly find ways to do it all AS part of my daily life, so here are some of the things I am doing. I hope they might give you ideas to creatively fit stretching or rehab into your life! Hair drying: calf raises when drying the top, and hamstring stretches when drying the underneath. Tooth brushing: balance on one foot to work stabilizers, then bend a leg, grab and ankle, and do a quad stretch. Advanced: lunges for hip flexibility. The same principles can be applied to the workplace and other public environments depending on individual threshold levels for personal humiliation and embarrassment. Mine are pretty high. While I am making progress in my return to my former ferocious triathlete and runner self, it is not without speedbumps and a bit of a toll booth. Eight weeks of gimpiness left me with misalignment in the back and pelvis, knots in my muscles to make any sailor jealous, and a protesting peroneal nerve. Hello, chiropractor! Hello, massage therapist! Right now I’m switching off hot dates with Dr. Greg Tilley, chiropractor, and Mario Travis, massage therapist, both who work with the Virginia Tech sports teams and know athletes. On the plus side, we can take pain and will do anything to resolve an injury. On the negative side, we are less than completely patient. Dr. Tilley’s big catch phrase with me is “don’t panic, I’ll tell you when and if it’s time to panic.” That gives you an idea of my personality. About my dates with Mario, who I’m certain could crush a bowling ball in one hand, well I thank God that I took a childbirth class (any man reading this is probably recoiling now). I tell you it comes in handy way more now than it did having my nine-pound kids. Of course, if I could have an epidural and THEN the massage, that would be a no brainer. It took everything I had to go to my happy place today during the eternity-and-then-some it took to work the knot out of my ailing quad. I’m pretty sure I left fingernail marks in the wood of the massage table. I’m liking the dates alright, except they always expect ME to pay. Just toll booths on the road to wellness I suppose. Footnote: My MS Word spellcheck thinks “triathlete” is a typo?! Dumb spellcheck! 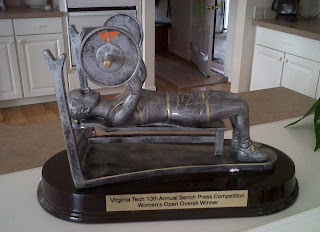 Today was the 10th Annual Bench Press Competition at Virginia Tech. It’s my third year competing and I really enjoy training for and competing in something that is pretty different from my usual endurance sports. Although bench is a staple in my year-round strength training, Jake and I ramp it up in the fall with this meet as a goal. And today I FINALLY got the 135 lb monkey off my back. Woohoo!! This weight has been my nemesis for a long time, both physically and mentally. It was 13 lbs over my weigh-in bodyweight. Bench is great fitness challenge for both body and mind because good technique is essential and form must be consistent and unchanging from rep to rep to maximize results. A strong bench press requires involvement from the entire body - legs, core, lats, chest, and arms. Each lifter has his or her own unique pre-lift ritual to get the hands and body precisely placed. You want to achieve a sense of tightness and control as if the bar is lowering against a set of resistance bands. Jake developed a warmup routine suited to me and it remains largely the same, week after week – weights and reps. I know what to expect and my brain has time to adjust to the increasing weight. At the meet it was nice to have the same warmup and same lift-off I have grown accustomed to from him (as he reads my subtle head nod!). Preparing for a three-second max effort, after a considerable wait, with surging adrenalin, and in front of a crowd can be a challenge. You trust in muscle memory and then can only focus on one or two things. On my first and second attempts, I thought only of achieving a feeling of control and tightness and a desire to have strong confident lifts that would carry into the subsequent attempts. On the third attempt, I simply repeated to myself “this is your day….this is your day.” I would never get this attempt back. I have worked on shifting my focus from negative thoughts of the heaviness of the weight to positive thoughts of moving the weight, so I went with that. It feels good to go 3 for 3 and has encouraged me to continue raising the bar (a bit of an unintended pun there, I'll take it!). And How Does This Relate To Triathlon? As with triathlon, successful powerlifts rely on consistent and progressive training, good technique, sharp mental focus, and belief!! Belief in the training process, belief in our trained bodies, and belief in our minds! Sometimes I am frustrated that my bench numbers (swim times/run times/and on and on....) aren’t going up (or down as the case may be) faster, but Friday night I spoke with the men’s 2010 bench winner who put up 430 lbs!!! He said he was happy to maintain or add 5 lbs from year to year. It reminded me that most legitimate progress is slow and any progress is good progress! We have to keep the faith and believe in consistent training even if the benefits aren’t always readily and dramatically apparent. So I will be satisfied with slow and solid progress and continue to work patiently toward all my goals, enjoying the journey and process. Love the VT on the plates and the fact that it's a GIRL!!! I hear this a lot around the gym especially after the new year and lately I have been ruminating on it. It might be in part because I have further tightened up my eating and meal planning the last few weeks in preparation for making a desired weight class at an upcoming bench press competition. The problem comes with the ambiguity of the word Anything. Anything in the quest for weight loss, means to most people, I’ll eat a little less, maybe not eat out so much, and pass on some desserts. Anything means I’ll be aware of my need to change my eating habits, but here’s the list of 200 things I can’t possibly do because that would just be unreasonable! Anything can’t include things that risk discomfort, or worse….a little hunger. Anything had better allow for indulgences when and where I want them. Or worse, a growing sense of failure. To be successful, Anything has to mean accepting change, forgoing short-term gratification for long-term goals, increasing discipline/maturity, and going against the grain. Anything very likely will mean some temporary discomfort and inconvenience until new patterns and tastes are established. Two years ago I pledged to do Anything to lose about 15 lbs (see the start of the story here). I surpassed that goal and have continued to add muscle and increase lean body mass. I’m not professing to be perfect and have this nailed, but over time I have substantially changed the way I eat and live and I continue to eat in a structured and healthy way. So what does Anything involve for me? Anything to me means that my coworkers invite me to lunch to be polite but they know I will virtually never join in. Anything is letting go of cultural norms and eating a meal with filling and fibrous green veggies at 9 am. Anything is managing my time better so I can commit time to meal planning and preparation. Anything means stripping back food to the basics and letting go of the notion that every meal should be a complex sugary/fat sumptuous out-of-body experience. Anything is being patient to retrain my body to crave healthy foods. Anything is drawing a line in the sand and choosing not to partake in the doughnuts, cookies, candies, and cakes that seem to be perpetually available at work. An important misconception compounding the Anything problem is the notion that eating to support weight loss/maintenance goals is all about sacrifice and deprivation. Nothing could be further from the truth! Over time I have discovered joy in meal planning and preparation. I spend time in the kitchen with the kids and enjoy working with my hands. It’s far more rewarding than sitting in front of the computer or TV. My tastes have changed too. When I am eating my simple chicken and avocado wrap or cottage cheese with almonds and oranges, there is nothing else I’d rather have. Others notice too and comment on how delicious these simple, colorful meals look. I feel healthier, have more energy, and take pride in making deliberate choices in my foods rather than reacting spontaneously with impulsive choices. By not eating out, I save time and money, and am more productive with my limited work hours. So if you are struggling with a weight-loss or training or professional goal, are you truly prepared to do Anything to achieve your goals? What is your personal definition of Anything and how far are you willing to go out of your comfort zone and habits? What are you willing to sacrifice and are you ready to reap the rewards of success? Next Saturday is the Virginia Tech bench press competition. This will be my third year doing it. It's always been a fun thing to focus on post-season during the winter months. I like the challenge especially since being relatively tall (5'7") and long-limbed I am not exactly the prototypical bench presser. I try to make up for that with good technique, mental focus, and belief. I think Jake and I have worked harder on it this year than ever and he adjusted our approach to incorporate negatives, positives, and elastic band work. Last year I benched 130 and was the overall women's winner. I compete in the 122 weight class so it's also a good excuse to focus on nutrition and get to a good performance weight heading into spring. I like my race weight to be around 126. I drop a few extra for the bench meet but they don't stay gone long! I'm coming to the end of my six week swim block. 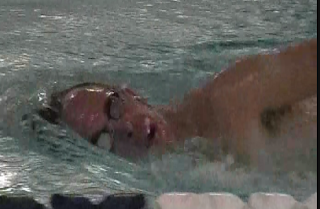 On Friday, I did two 1000yd swim ladders (50-50-100-100-150-150-200-200 alternating fast segments with recovery segments) and Coach Jim captured some video footage without me knowing. That was good because I couldn't "spiff it up" for him, it was truly how I swim. He told me I am looking much longer and smoother in the water and I said that was exactly how I felt. When I swim I envision a birch leaf floating effortlessly on the water's surface, and with drill work this winter I discovered that if I focus on a subtle "catch-up" style with my arms, I improve my balance in the water. 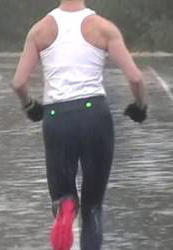 The drills that most help me are obviously the catch-up drill, and also using an elastic band around my ankles to limit the amplitude of my kick. 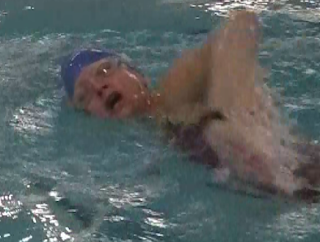 To swim well in that case, I have to keep my arms out in front a split-second longer. I DO need to think about not lifting the top of my head so much and instead letting it lead the way through the water to create the little trough that would let me breathe lower in the water like TJ here. These pictures help enormously. I'm leaning toward a left arm crossover too and need to be aware of that. Still no word from the doc. I have an appointment Tuesday in case I don't hear via phone sooner. It's been a very tough return to the boot and I have zero patience remaining for the comments and unsolicited advice from unqualified advice-givers. I've had it with all the assumptions people make about how I might have brought this on myself, what I need, or what I should be doing. I flew off the handle when my spouse asked how my FOOT was. It's perfect, thank you, did you mean my leg? Patience is running very very thin. I'm still grieving over the loss of the Boston dream for this year. And frustrated because my leg feels perfectly fine to walk, bike, and yes, run on (I know because I tried a little last week). The "only" issue is the remaining bone tenderness, and now I am second-guessing whether I should have even bothered mentioning it or not. But I did, and here I am, waiting word, staying busy. Some periods of your life things go like clockwork. Last year was one of those years in terms of training and racing. I hit every race I wanted to do, achieved all my major goals, had no downtime due to injuries, and had a blast! I won a bench press meet, a 10-miler, raced 5 triathlons and placed in the master's division of the VTS, ran Richmond and re-qualified for Boston, and competed in various road races and swim meets. It could not have gone any better!! But for every up, there is a down. Here's the downer. Today I had what I hoped was a final visit to the orthopedic doc for my leg injury. I had a retirement ceremony of sorts for the boot Friday and headed off for a nice walk with the kids and dog Sunday. I feared this appointment knowing I still had a hot spot at the site of the fracture, but expected to hear that it was a normal part of the healing process. That was not what i heard. Bottom line is I'm headed for an MRI which will tell us if it's still a bone issue or just the connective tissue. The latter I can work through. The former lands me in the boot for 5 more weeks with greater restrictions than before. There are even worse possibilities than that. So right now the boot is back on. I enjoyed my weekend of freedom. I had my cry. I admitted that Boston is probably not in my reality for this year. I am moving forward. There is still that chance that I will get good news from the MRI. 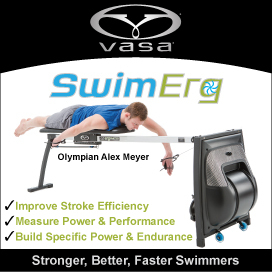 Either way, by summer, I will be a much speedier swimmer than I would have been without the injury. To wear many hats means to have many roles, which is true of all of us age-groupers. We have jobs, families, homes, civic and volunteer roles, and maybe even another hobby or two! But I think we are better described by our shoes than our hats. Our shoes (and boots) can be utilitarian (my trainers), make us faster (racing flats), make us think we are faster (zoomers), increase efficiency (cycling shoes), get us off our feet (yes, I saved the cast), keep us from running (boot), protect our feet (flip flops), and occasionally make us look professional (boring black shoe). Today I had much to celebrate. First of all, I retired the boot and set out today in two matching shoes! What a cool/odd sensation! It isn't often that your own body part feels foreign and that a shaped footbed seems bizarre and very tall. But honestly I feel great and celebrated with a 70 minute trainer ride on my own bike for the first time in 7 weeks and a fun workout at the gym with Jake. The second thing I had to celebrate was wrapping up a very successful pedagogy conference -- two days, 600 attendees from 11 countries, and very few hiccups! For weeks I have not thought beyond February 4 and today I have been a zombie. It explains the lack of blog postings. As the chair/organizer I gave up trying to participate IN the conference so I missed the keynote speaker, Terry Doyle. The main takeaway point everyone seemed to leave with was that to get the most from our minds we need to work our bodies too. I'll second that. Similarly, I am grateful for the many shoes of my life. I firmly believe my work makes me a better athlete and my athletics make me a better contributor at work. The more my work schedule challenges my training schedule the more determined I become to fit it all in! I did not schedule workouts for the conference days on Thursday and Friday but I still managed to get my 4 swims, 2 rows/bikes, and 3 strength training workouts in for the week. I also packed my food for the conference knowing a big shift in eating would jeopardize my energy levels. As a result I felt great and maintained an even keel throughout. I look forward to getting back to "normal" (is there such a thing?) on Monday with work and training. It's time to see what I've got with this leg and what it can do in the next 2-1/2 months!